This is one of the greatest changes to a Star Wars toy that Kenner ever made given the fact that it appeared in photos for kids to see. I don't know if it was destined to be changed or maybe just fell under Lucasfilm's tight rules for authenticity. Of course the released version appears more like the movie creature, but both versions had the flap in the back so the figure would be inserted into it standing up. It's interesting to see how the saddle was created so that it gave the illusion of the Stormtrooper's legs straddling the lizard. This exact photo was used on the second series (21 Back) Star Wars figure cardback and in the 1979 Kenner in-pack catalog, but this is the first time we've seen one is such great clarity. The text calls it a "lizard" one time and a "dragon" the next, but what's weird is that the description of the action feature jives with the released toy while it's clear that the head on this prototype moves up and down. 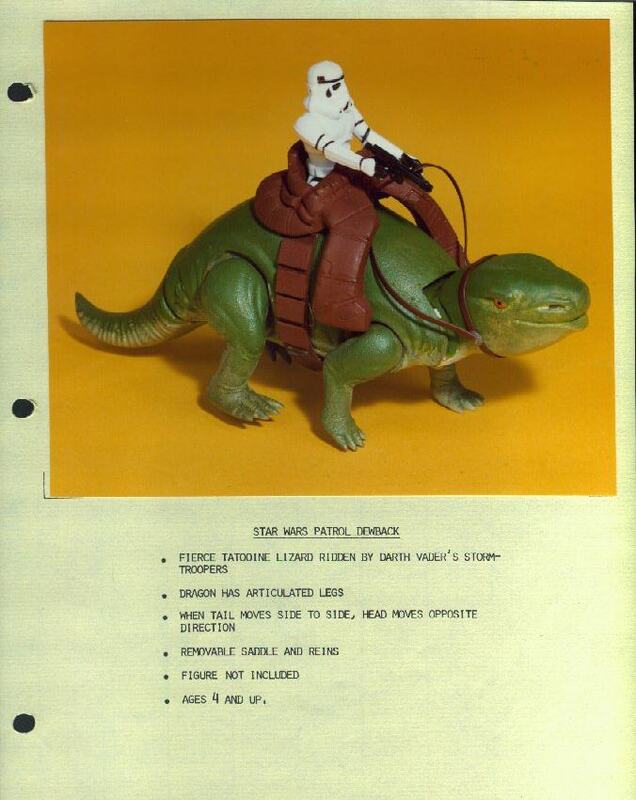 This Kenner product sheet is part of a 3-ring notebook containing early photography and descriptions of roughly 30 Star Wars toys. Each sheet has the same format with typed information about the product and a pasted-on glossy photo. Most photos are representations of the toys but they often differed from their released counterparts which makes it quite unique to look at. These were generally mock-ups of sorts created because the toys weren't ready in time for photography and early marketing. This book came from an ex-Kenner model maker who was dilligently tracked down by a collector. Many thanks go out to that collector for helping turn up a piece of history like this.